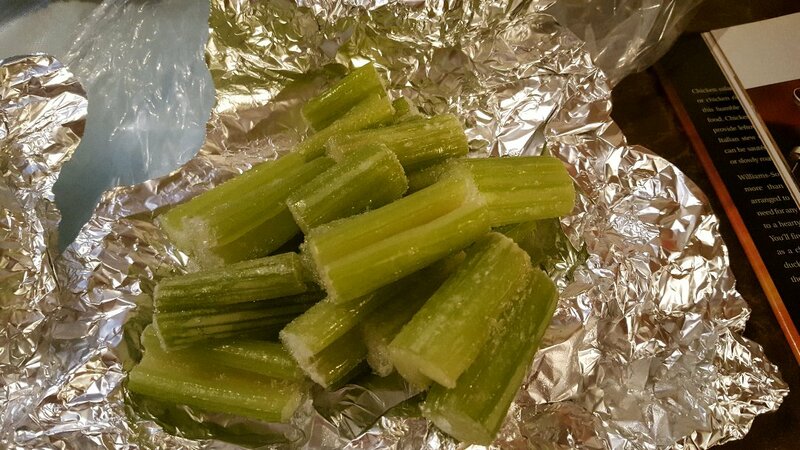 For the soup, I used up the last of my freezer celery. It fared pretty well for being in the freezer for nearly 5 months! 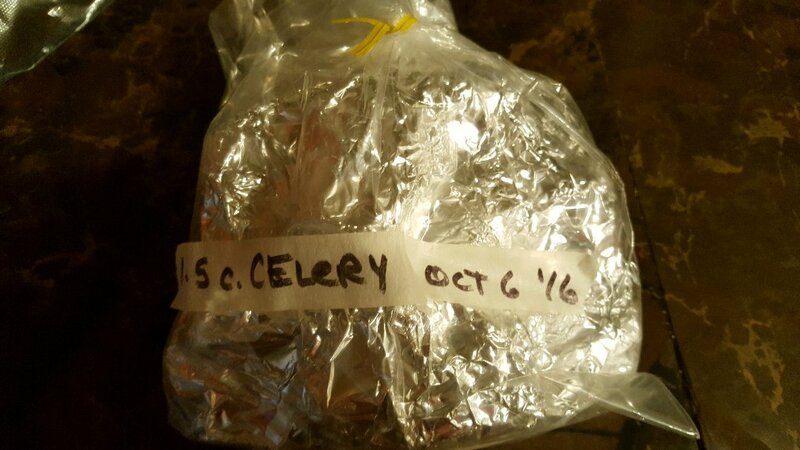 This is good because now I know that the supply I froze should be doubled the next time celery is very fresh and on sale. We rarely eat it raw so this really works for us. Back in the fall, I just washed, dried and chopped it up; wrapped it in foil and then a freezer bag and this method has been working for all of my freezables. We've had our deep freezer for a year and a half now and it's so wonderful! 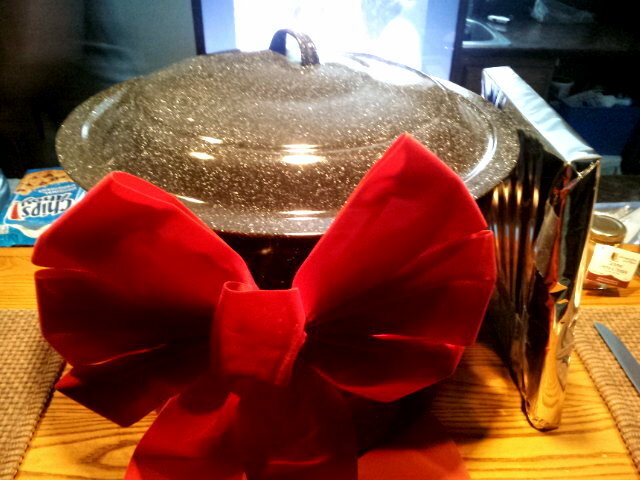 That got me thinking about my birthday last year when my boyfriend bought me a water bath canner. I started food preservation probably in the fall of 2015 when we invested in the deep freezer. So far I've only used the water bath canner last summer when I bought 80 pounds of tomatoes at the farmer's market for $24.00. 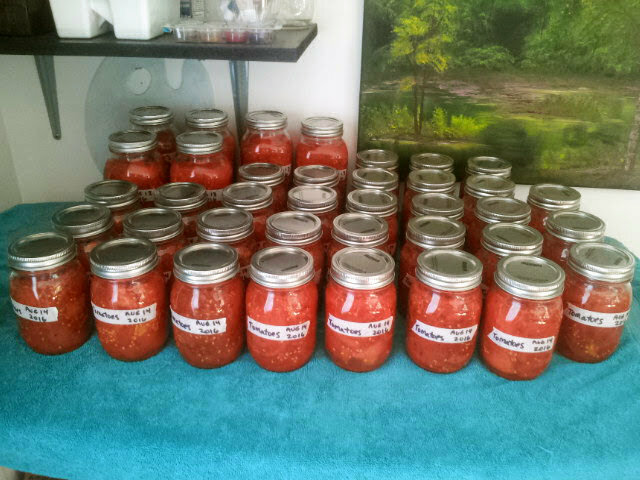 I was so proud of my canning efforts and I definitely got the bug! We still have about a third of this supply in the pantry for the rest of the winter. It was SO worth it! I was talking about dehydrating oranges lately. We love our cocktails and go through about a Mason jar of these a year. Last fall I used my dehydrator to dry out all of my herbs that I knew I couldn't use fresh. Since my planned garden probably won't produce enough to can a lot of stuff this year, I'm going to take advantage of that farmer's market so that I can get some fruits and lots more tomatoes to can for next winter. And I am now squirreling away a little bit of money each month to buy myself a pressure canner in 2018! This is very exciting! It's funny when I think back...I thought the whole idea of food preservation was so overwhelming, but if you start a little at a time and buy supplies when you can, you quickly have everything you need! I'm now doing some research on freezer meals for those lazy summer nights when I don't feel like cooking. I've already adopted a monthly grocery shopping day and it's been really successful! I took a few days and made a meal plan for a month, then wrote my list based on the flyers. I've saved money, not only on food but also on gas and wear and tear on the car. I used to dread shopping day every two weeks. Now I'm looking forward to next month's plans. 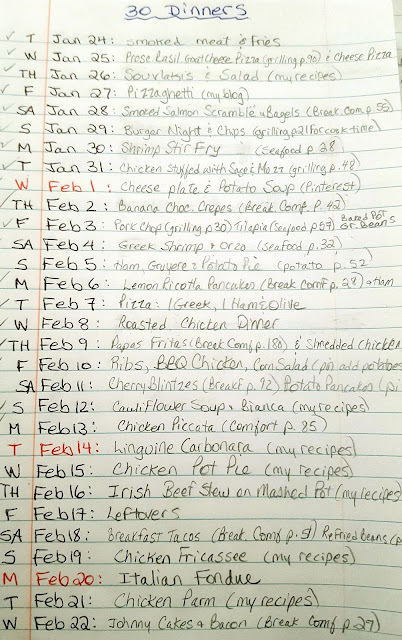 Actually I still have enough food for another few weeks, so my "monthly" shopping turned into a 6-week endeavor. Nice huh? I stray a little from the plan, but I have all of my ideas on paper. All of this is so rewarding! I had no idea you had a blog. I'm following now. 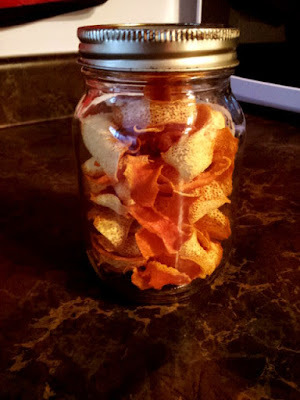 I have taken lemon peelings and frozen them for recipes. 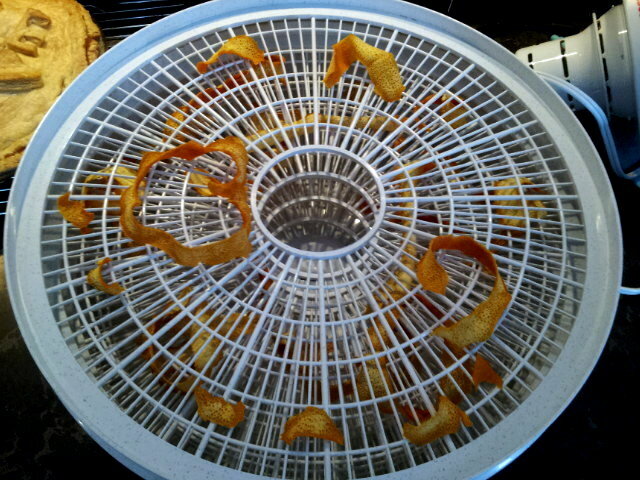 I haven't been able to buy organic oranges, but dehydrating the peelings is so worth it. There truly are so many ways to save money on food. BUT, for the most part, that means there has to be a homemaker/cooker on the premises! These things take time, thought and energy. You're so right in stating that good food preparation (let alone saving money) gives such satisfaction. I'm going to get such inspiration from your posts! You are really off to a great start! I didn't see the opportunity to follow your blog - did I miss it somewhere? Hi Kristina :) I didn't have a blog until a few days ago actually! Thanks for following :) Oh you know I never thought of freezing the peels...that's a really good idea. I just shudder at the idea of throwing ANYTHING out anymore. I am trying to reduce my use of the garbage bin as much as possible too. Thanks Mama Pea :) You are always so encouraging :) And you're so right. 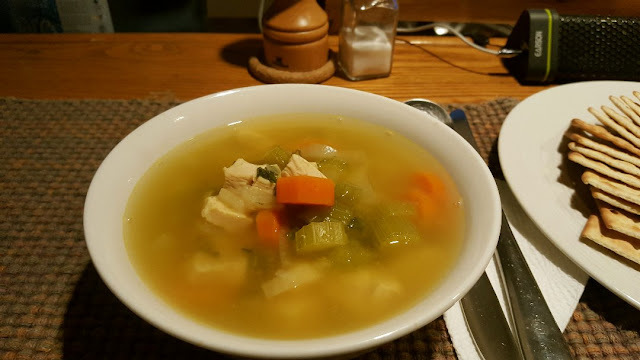 Not everyone likes to spend hours in the kitchen, but I just love it. I know my boyfriend appreciates it too. I'm trying my best to do everything from scratch. It's very nice to have a freezer full of food too! Thank you Susan! :) Okay, follower button, I'm working on it. I think I need to have a Google+ account for that, I'll check it out, thanks so much for mentioning it! Nik, I thought so...but I fixed the Followers button...have no clue about the notifications.